Ruderal bumblebee (Bombus ruderatus). Photo credit: Dave Goulson. One of our largest bumblebee species, found only in the south of England and scarce even there after a considerable decline through the 20th century. Widespread across this range, but never abundant where found. All three castes are similar, with a yellow-black-yellow thorax, a yellow band at the base of the abdomen, and a pure white tail. Ruderal bumblebees (left image: melanic variety). Photo credits: Ben Darvill (left), Ray Reeves (right). Similar in appearance to, but generally bigger than, the Garden bumblebee (Bombus hortorum), Heath bumblebee (Bombus jonellus), and Barbut’s cuckoo bumblebee (Bombus barbutellus, which probably parasitizes this species). The cuckoo does not have pollen baskets, and both it and Heath bumblebee have round faces only as long as they are wide. The male genital capsule can be useful to check the ID, particularly of worn specimens. The Ruderal bumblebee is very similar to the Garden bumblebee, and some individuals may prove impossible to differentiate, particularly in the field. Males of the Garden bumblebee have black hair around the mandibles where the Ruderal bumblebee have ginger, but females are more difficult to separate, and the only fully reliable method is to measure the length of the face: : the Ruderal bumblebee has a longer face (more than 1.5 times as long as wide) than the Garden bumblebee (1.1 to 1.4 times as long as wide). Generally, the thoracic yellow bands are more equal in the Ruderal bumblebee (the Garden bumblebee has a wider front band than back), and the abdominal band in the Ruderal bumblebee is constrained to the first abdominal segment, rather than extending backwards onto the second. The Garden bumblebee is also generally less neat in appearance than the Ruderal bumblebee, which has very even-length hair. The Ruderal bumblebee produces melanic (all black) individuals far more frequently than the Garden bumblebee, or indeed any other British bumblebee species, and all-black bumblebees are likely to be this species. 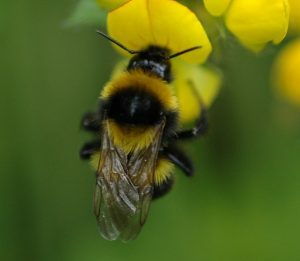 Queens and workers can look similar to the Short-haired bumblebee (Bombus subterraneus) but the location (Short-haired bumblebees are currently only found at the reintroduction site at Dungeness, Kent) and presence of a second abdominal yellow band (in Short-haired bumblebees) is usually distinctive. If in doubt, the ventral surface of the sixth abdominal sternite should be checked for the presence of a central longitudinal keel, present in the Short-haired bumblebee but not in Ruderal or Garden bumblebees.